Lucia Castagna first appears in Fairport Harbor, Lake County, Ohio, area either 1927 or 1928. In America, Lucia Castagna was known as Lucy Casti, then after she married, Lucy D’Abate. Lucia Castagna, daughter of Domenico Antonio Castagna and Maria D’Abate, was born on September 10, 1903, at McKeesport, Allegheny County, Pennsylvania. She married Felice D’Abate, son of Giacomo D’Abate and Maria Felicia LaGamba, in 1925. Lucia died on July 24, 1980, at Lakewood Hospital, Lakewood, Cuyahoga County, Ohio, at age 76. Her body was interred at Riverside Cemetery at Painesville, Lake County, Ohio. Lucia’s parents immigrated to the United States sometime before 1903. While living in Pennsylvania, Lucia was born. Lucia and her parents returned to Italy in 1906 (Lucia was three years old); Lucy was raised in Italy. She returned to the United States in 1923, at age 20, and joined her brothers, who were living in Pennsylvania. Lucia married Felice D’Abate while living in Pennsylvania. They family moved to northeast Ohio after the birth of their first child. Lucia, and her husband, owned and operated a grocery store in Painesville beginning in 1938. 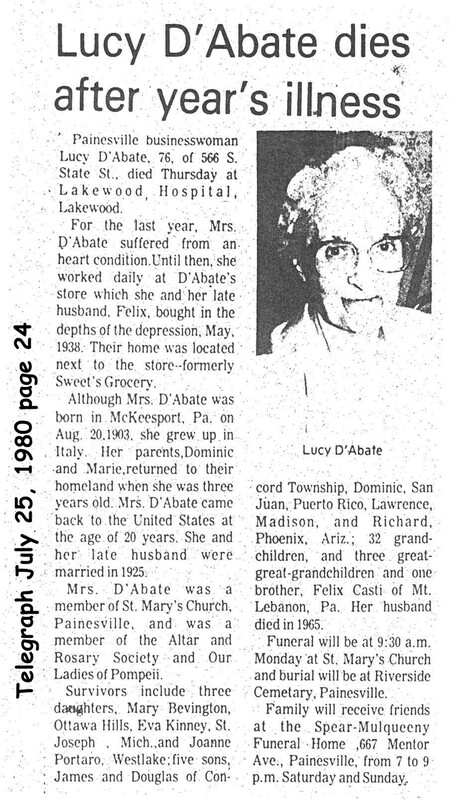 In the late 1930’s, Mrs. D’Abate’s mother, Maria D’Abate, moved to Painesville for an extended visit. At the time of death, Lucia resided at 566 South State Street, Painesville, Lake County, Ohio. 1. Mary D’Abate was born on February 28, 1927, at Pennsylvania. She married John Bevington. 2. James J. D’Abate was born on July 17, 1928, at Fairport Harbor, Lake County, Ohio. James died on August 22, 2004, at his home, Painesville, Lake County, Ohio, at age 76. His body was interred at Riverside Cemetery at Painesville, Lake County, Ohio. 3. Dominic D’Abate was born about 1929, at Ohio. 4. Lawrence D’Abate was born about 1932, at Ohio. 5. Eva D’Abate was born about 1934, at Ohio. She married Ronald Kinney. 6. Joanne D’Abate was born about 1935, at Ohio. She married Ronald Portaro. 7. Richard D’Abate was born about 1938, at Ohio.